We spent our Saturday evening in the midst of an entertained gathering in the chilly open-air grounds of Terra Alta. The purpose of the gathering was to witness a “Banter In Court”, a theatrical play written and directed by Elsie Srodah. 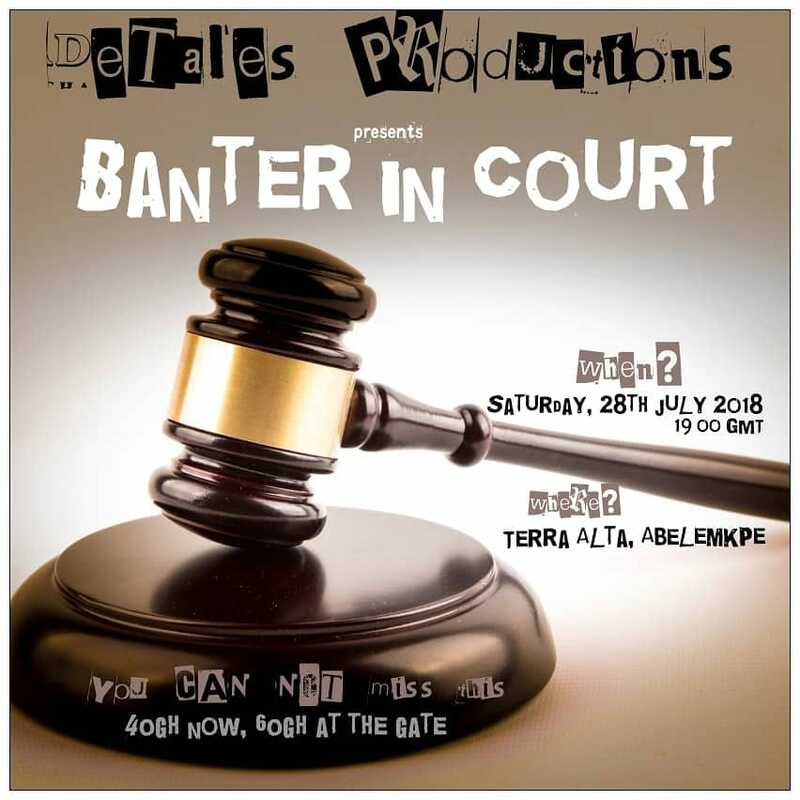 Banter In Court is a comedy-drama set in a day inside the space of a court house presided over by Judge Yoofi Koomson’s (Bex Agbeko Mortty) who is celebrating his 10th anniversary on the bench. He and his clerk go through the day trying cases from opposing counsels Alexa Bill (Cecilia Anno –Barnieh) and Martin Yeboah (Gideon Kojo Yeboah Boakye) that include, a failing marriage, a crazy scientist and a shady man of God. Judge Yoofi Koomson has to sit through the banter and all the drama as has he deals with his own internal conflicts. The play opens with a choir singing a tune that would inspire a sense of patriotism in any Ghanaian which sets the tone for the plays subtle hints of the Ghanaian ways of reacting and dealing with problems. The seriousness of a court setting is comically watered down in this play with the playful nature of the characters. But the emphasis of the play’s theme is very strong in the dialogue even when it makes you laugh. The characters present themselves far from perfect even as they wittingly banter each other. At varying points in the play, you get to see each character’s flaw and get a different view of their persona’s. Particularly, Judge Koomson initially comes off as grumpy, tardy and lazy yet later reveals a humane and chivalrous side. The humor is spot on a very well delivered in in this play from very well thought out characters and marvelous delivering from the cast which includes, David Asiedu, Prince Agamah, Jeffrey James, Esther Amankwa Opoku and Atoapoma Oteanankanduro. Disappointingly, the entire experience of this play was marred by very terrible sound glitches. The performers consciously did their very best to save the night by sticking to “the show must go on” attitude regardless of the very unpardonable poor quality in sound and feedback. We would rate this stage play 3 out of 5 stars for the time well spent and the quality of humor it provided albeit the technical flaws. Banter In Court uses satire to subtly speak on a wide array of issues ranging from politics, religion, law and relationships. Mostly subjects with many grey areas that need to be taken with a grain of salt. We applaud De Tales Productions for the nice time we had and would love for this play to be staged again on a much bigger stage hopefully to a much bigger audience. If you got to witness the Banter In Court do well to share with us your thoughts on it in the comments section below. Stage Play: Red Hot Mamas … On a Legon Stage.